Description: In Zambales, the eruption of Mt. Pinatubo in 1991 resulted in the displacement and separation of the Aetas from their ancestral land, depriving them of their lifeblood. Today the spirit of “Kainumayan,” the name by which the Aetas referred to FPE’s enabling and supporting intervention, once again fuels their drive for self-sufficiency and well-being. 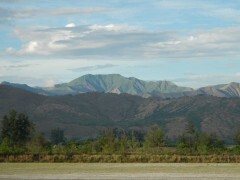 The Zambales Mountain Range is part of the Zambales-Bataan biodiversity corridor. Mt. Pinatubo, the volcano that produced the second largest terrestrial eruption of the 20th century, is found within the range. A center of flowering plant endemism, the area is home to several of the most attractive Philippine wild orchids with high commercial value. Sixty-six plants are recorded to be unique to the Zambales Mountain Range, including the flowering plant, Ardisia zambalensis. Once the stewards of the mountains of the Zambales range, the Aetas have become hesitant occupants of hastily-built resettlement villages, following the aftermath of the 1991 Mt. Pinatubo eruption. and clearing practices, particularly in upland areas, that result in the fragmentation of habitats. Incidents of wild fires resulting from reckless clearing methods. Slash-and-burn farming – while sustainable in the past – has become untenable when migrant settlers compete with Aetas for good farming areas. This influences the spread of illegal logging activities. Mining of talc in the area, coupled with sand and gravel quarrying poses a potential threat. Poaching of faunal and floral resources, as well as illegal logging and charcoal extraction, reduce the project area’s biodiversity value dramatically. Strengthened four CADC-holding POs, which led to the Pederasyon ng mga Aytang Samahan sa Sambales (PASS). More than a development project and management scheme, Kainumayan embodied the aspirations of the Aeta people. It is a Sambal term roughly translated as self-sufficiency and well-being not just of the people, but also of the natural environment. The co-financing and co-management structure of the Kainumayan project helped re-establish a sense of franchise and proprietorship among the Aeta communities, who had previously been displaced by the Pinatubo eruption. Capacity-building and training on leadership, organizational management, and advocacy. Assistance in alternative livelihood projects which helped lessen the communities’ impact on the natural resource base. Strong advocacy and action aligned towards the reclamation of ancestral domain rights for the Aetas, including the drafting and finalization of the Ancestral Domain Sustainable Development Protection Plan (ADSDPP). PASS has successfully turned over leadership and management of conservation initiatives to the younger generations. Now equipped with their own office, PASS members are also adopting modern technologies and integrating them into their daily lives. Establishment of networks and linkages (LGUs, other organizations and institutions). Advocacy actions have contributed to temporarily stalling the ongoing mining operations in Maporac.